Because some Accessories are Necessities! 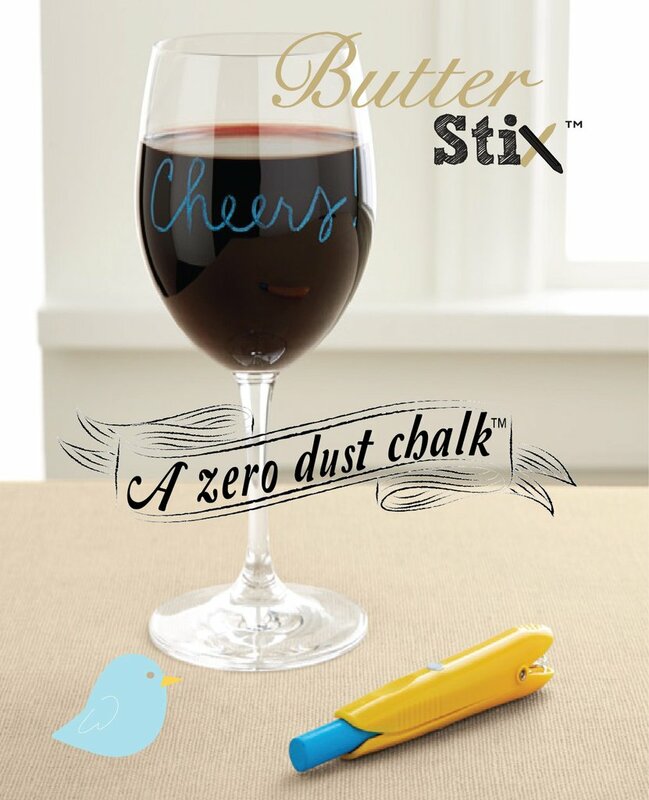 Chalk without the dust? Say it isn’t so! Jaq Jaq Bird has been perfecting this liquid-like chalk for years and finally came up with an exclusive perfect formula of Zero Dust Chalk that they like to call “ButterStix”. It glides on smoothly and brightly as a pastel on most non-porous surfaces. However, unlike crayons or markers, the ButterStix wipe off easily with a damp cloth. Are you thinking of the possibilities, too? I’ll give you some suggestions! We have found the ButterStix to be great for labeling containers, cups, walls, plates, counters, glass, and, of course, chalk boards. There is no DUST, no STAINS, and (most importantly) no MESS. YEAH! I highly recommend getting the 12 ButterStix™ in a pack with a chalk holder because it makes it easy to write. 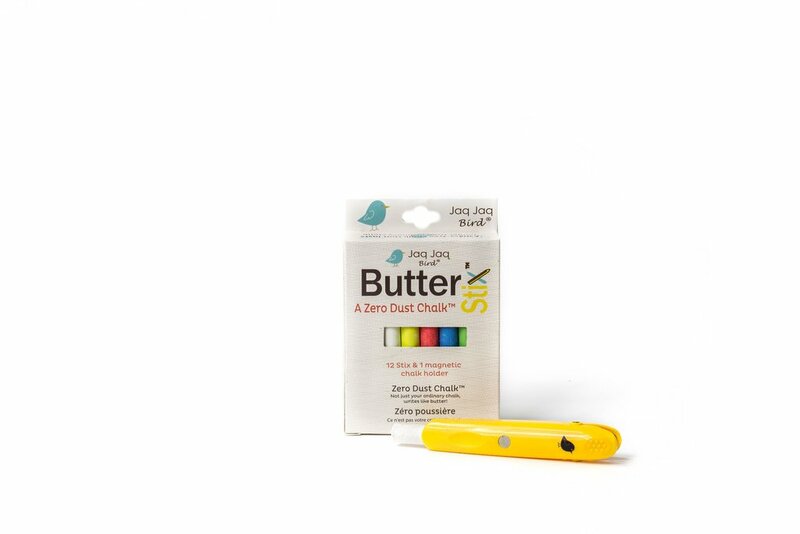 The pack of ButterStix includes a magnetic chalk holder and you can choose white or multi-color pack set. The ButterStix are completely safe for kids, comes in a variety of colors. Wipe with a damp cloth. Choose white, multi-color pack, or multi-color pack set that comes with a holder. We are very impressed with these liquid chalk markers and the colors are vibrant and easy to use. ButterStix are also kid-friendly, non-toxic, and safe, which is an added bonus when you have a preschooler in the house. Create eye-catching drawings and writings without the mess! Unleash your creativity with these vibrant chalk markers! Remember, ButterStix are suitable for use on all non-porous surfaces including whiteboards, LED boards, glossy boards, metal, plastic, glass, windows, and chalkboard stickers – so get creating! EASY TO CLEAN: just wipe with damp cloth. If ‘ghosting’ remains, a damp Mr. Clean Magic Eraser will do the trick. Why “Jaq Jaq Bird”? When creator Grace’s third child, Micah was learning to talk he would say, “Jaq Jaq,” a Korean onomatopoeia translated as “chirp chirp.” The name stuck! Jaq Jaq Bird has been featured on HGTV, CNBC, NY Time Out Kids, Rachel Ray, Parents Magazine, Washington Post, Dwell Magazine, and numerous other press. Grace has worked with Land of Nod, Nordstrom, Target, Aaron Brothers, The Container Store and other major retailers in the United States and Asia.